I have always said (and maintain) that I accepted the building of the New Visitor centre as it was decided by due process. My biggest concerns have more being associated with the disregard for adhering to promises and obligations under the Planning Conditions and other legislation. 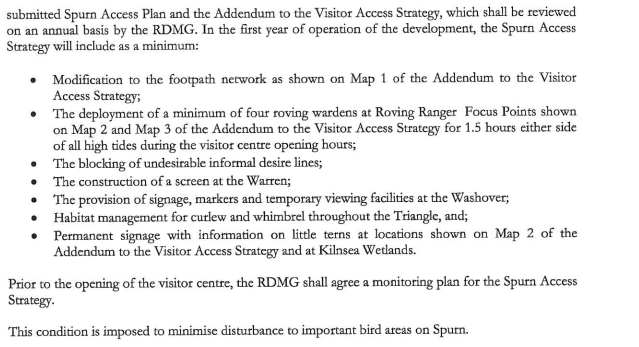 Given the rather surprising decision to ban me and others from entering YWT land at Spurn it prompted me to do some further checking of the documentation submitted as part of the Planning Application for the New Visitor Centre at Spurn. I have extracted some of the content from the Planning Conditions, Shadow Habitats Assessment and Biodiversity Enhancement and Monitoring Plans. These are important as they go into quite some detail as to how the special qualities of the site should be protected. Who cares that the mitigation measures outlined in the Shadow Habitats Regulations Assessment, SSSI Impact Assessment and Biodiversity and Monitoring Plan have been implemented? Why has a Wildlife Trust not fulfilled its obligations relating to Mitigation on a site with the highest designations to a site we can impose (SPA/SAC/Ramsar/SSSI)? Why has the local authority not fulfilled its obligations as the 'Competent Authority' in ascertaining that all measures listed within the Shadow Habitats Regulations Assessment have been implemented and ascertained that the European Site has not been impacted upon as a result of the development? Why hasn't Natural England ensured that the protected habitat at Spurn has not been impacted upon as a result of the development? The reason for the decision said that the VC would give better control over people accessing the peninsula. Reports have never been so high on incidents of motorcycles, quad bikes, people using drones, people accessing sensitive areas and people accessing with dogs. How does a visitor centre set back 100 yards from the road on to Spurn give better access control than a perfectly placed cabin that everybody pretty much had to walk by as they went on to Spurn? Someone came up with the idea of Roving Rangers. This idea has failed to the point that there will be a re-submission of an amendment to condition 10 where RR,s are mentioned. Who has checked that the VC gives better control over access? Who is ensuring that the VC gives better control over access? Who cares that control over access is clearly worse than it was before the Visitor Centre was built? The reason for decision also mentions the Habitats regulations. I'll cover that further in this blog post. The artificial light is mentioned numerous times within the Shadow Habitats Regulations with the potential to cause harm to birds and bats. So much so a Planning Condition was imposed to ensure compliance. Who has checked the design? Who has assured themselves beyond all reasonable doubt that the design is compliant and will not impact on the European Site? Who cares? An extract from the SSSI Safeguarding Plan is below. It states 'as part of construction works'. Well construction works have finished. It states one of the scrapes has already been completed. No it hasn't it was filled in when they started to pile up the rubble. It states that the second scrape will be completed as works are completed around the visitor centre. The field is STILL full of builders rubble. Who has checked that the works as described within the SSSI safeguarding Plan have been completed? Who cares that Well Field still remains full of builders rubble when it should have been developed as mitigation? Further text from the SSSI safeguarding plan regarding lighting. Planning Condition 10 was imposed to minimise disturbance on Spurn. Has the monitoring plan been agreed? No. Is the idea of Roving rangers Working? No. Is habitat management for curlew and Whimbrel happening in the Triangle? Well Field (within the triangle) is still full of builders rubble. At the last RDMG meeting it was agreed that the spoil in Well Field would be moved in the first 2 weeks in August. Is it still there? Yes. An extract of the Shadow Habitats Assessment is below. Has the Local Authority (as the Competent Authority) ascertained beyond all reasonable doubt that there will not be an adverse effect on the integrity of the European Site? Well the Unimog impacts massively on the dune system (named within the designation) and only on the last set of big tides the Unimog displaced 6500 Dunlin (also named within the designation) when it crossed the breach. Is the Unimog being operated as described within the Shadow Habitat Regulation Assessment? No. Has the Unimog got consent for its use from Natural England? No? The Site is also (on top of all the other designations) a National Nature Reserve which should have its own Management Plan (a document produced by the land owner and commented upon by stakeholders and approved by Natural England). The MP format states that all National Nature Reserves should be managed with 'exemplar standards'. There is currently no Management Plan in place for Spurn. Section 1.31 states 'YWT does need to ensure that visitors are informed about the highly sensitive nature of the site'. Remember not everyone will go through the visitor centre. The photo above is the entrance to the reserve. Where does it mention that Spurn is a European Protected Site? That is a Special Protection Area, that it is a Special Area of Conservation, Ramsar Site, or SSSI? Where does it say in plain English that you are entering a Nationally Important Site? The small print does this get the message across that you are about to enter a Nationally Important site? Major review? Who has ensured beyond all reasonable doubt that the 'major review' has taken place? The last time I was there, there was no change in how you access the breach. Has anybody ascertained that the 'major review' has actually taken place? Given that the shifting dunes, fixed dunes and sea buckthorn are all potentially damaged by the Unimog, who has satisfied themselves that these protected systems are not being damaged? Or that the excavation works carried out after the last big storms to enable the Unimog to access the breach didn't damage habitat named within the designation? SPA and Ramsar listed species (Dunlin) were disturbed from their roost by the Unimog taking people to a ghost walk on the point. The Unimog passed 4 times over high tide in one night. Further mention of habitat creation in Well Field. The prediction that disturbance could take place once the facilities were in place was rather prophetic.Bold statements on how staff will be trained to control noisy or disturbing activities. Is it happening? See previous regarding lighting. Is the statement about light intensities being as low as is permissible with safety a true reflection? Where are the baffles, hoods and louvres? Who cares? A summary of the risks and proposed mitigation is in the table below.Who has satisfied themselves that all risks have been identified, adequately assessed and mitigated for? Is all mitigation in place? Well I conclude that it is not all in place and by definition the effects on site integrity for all of the international designations cannot be ruled out. The number of Unimog trips is listed above. Is this reflective of the time table?-there are 9 trips stated for September and a quick check on YWT website will tell you that there are 20 trips planned for September. This on a Unimog that does not have consent for its use, arguably damages protected features and is listed within the SHRA as only having 9 trips in September. Who is doing the checks? Extracts below are from the Biodiversity Enhancement Plan. More bold statements about effective visitor management. Well Field is full of builders rubble. The newly created 'wetland' on Clubleys field are nothing more than bone dry hollows in the ground. Surely Wetland means Wetland? Who has checked that blackout blinds are being used in the Visitor Centre? Are the bat boxes fitted on the Visitor Centre? Are the Swallow, House Sparrow and Tree Sparrow nests fitted? Is the large communal Swift nest fitted on the North Western Elevation? Has a barn owl box been installed? Has the reptile hibernacula, egg laying habitat and invertebtate tower been installed? It would appear that 10 out of the 13 enhancements as listed within the Biodiversity Enhancement and Management Plan have not yet been installed. I find it quite incredible that people have made important decisions based on the content of these documents. Why hasn't anybody checked to ensure that all the commitments were fulfilled? Its a European Site with Internationally Protected Species we are not messing about here. Everything stated in this blog post is factually correct to the best of my knowledge. Thanks for reading.